The Foundling is a multi-discipline, video and sound installation by the artist Terry Smith, which opens at the Foundling Museum on Wednesday 7 October 2009. This major new work has been commissioned by Gill Hedley for the Foundling Museum’s contemporary art programme. The installation will be presented in the form of a series of video pieces displayed in the dedicated Exhibition Gallery as well as throughout the period interiors of the Museum. A sound work will be installed on the original eighteenth century staircase. Smith has also created works on paper, exhibited in the café space. Using found images and sounds as well as deconstructed scores by Handel and Vivaldi, the foundling plays with ideas of the hidden and the lost. In a year which celebrates Baroque music this piece acknowledges the active contributions that Handel and Vivaldi both made to institutions in London and Venice respectively, dedicated to giving vulnerable and destitute children a second chance at life. The Foundling is a collaborative project bringing together musicians, composers, sound designers and writers and cinematographers. Smith’s approach to these projects is an open collaborative process. Discussions, workshops, rehearsals and performances have enabled him to construct a work that is informed and determined by the different skills and ideas of the individuals involved. The Foundling is a unique meeting of different art forms. Crucial in this collaboration is Ian Dearden, renowned composer and sound designer, Linda Hirst (vocalist), Oliver Coates (cello), Miguel Tantos (trombone), the cinematographer Jonathan Callery, and the actor Julian Bird. A related publication will contain new texts by writer Mel Gooding. 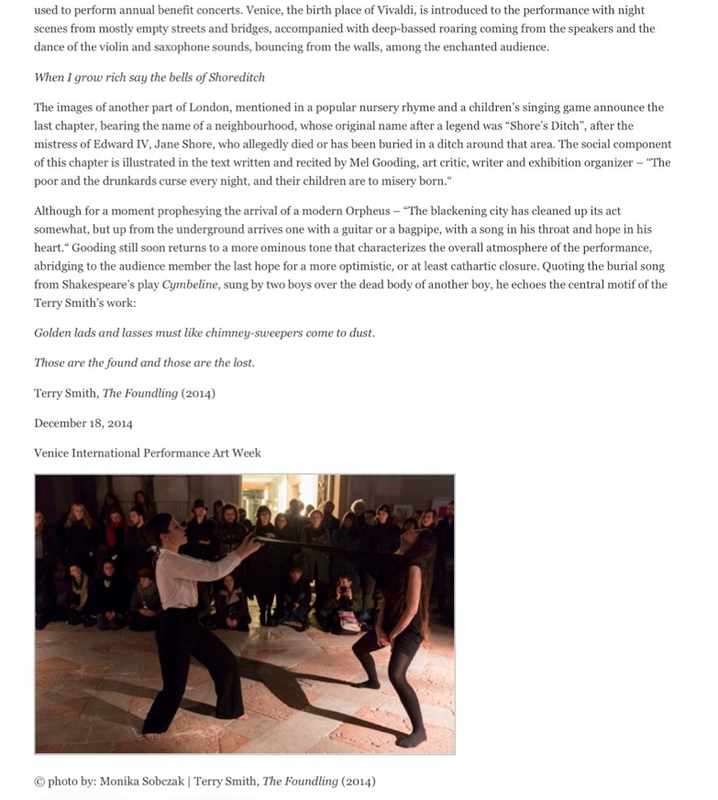 Produced by Clare Fitzpatrick for workinprogress, The Foundling is supported by The Foundling Museum, The Arts Council of England and The Foyle Foundation, The University of the Arts, Wimbledon.